Years before the members of Blackbird Raum ever played their first show, they lived together in abandoned buildings in Santa Cruz. With no electricity, they picked up whatever instruments they had access to—banjo, mandolin, accordion, washtub bass, washboard. "That's why we learned to play folk instruments," says mandolin player Mars. "They were lying around." The idea of forming a band came a while later, after discovering a group from Eugene, Ore., called the Sour Mash Hug Band. 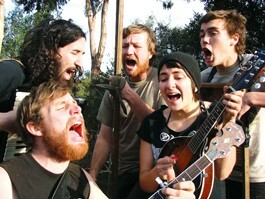 "All of us were scraping by in the most squalid manner possible," says banjo player Caspian. "The idea that these people played on the streets and got 30 bucks, we thought they were millionaires." As Blackbird Raum took shape, they wrote lyrics about capitalism's destruction of nature and the unjust treatment of the poor. They became at once a backwoods jug band and a political punk band. "Nobody wants to touch us with a 10 foot pole, 'cause it's like, how do you sell that? It's not really folk-punk. It's not really punk. It's not really folk. It's kind of anarchist. What is it?" Mars says. Find out when Blackbird Raum play Sunday, Aug. 28, at the Arlene Francis Center. 99 Sixth St., Santa Rosa. 7pm. $8. 707.528.3009.